Our destination today is one of the most unusual natural attraction in Israel, the Sorek cave in the Judean Mountains near Bet Shemesh. We’ll have lunch nearby and then explore the remains of an ancient khan with it’s well-preserved mosaic floors, and hike down the Emperor’s Road. The drive to the Sorek cave will take about an hour from either Tel-Aviv or Jerusalem and is especially scenic as you drive through American Independence Park, which is also known as USA Park. Exit Route 1 at the Sha’ar Hagai junction and follow Route 38 into the town of Bet Shemesh following the brown directional sign toward the stalactite cave. Drive through this quasi-industrial town on Routes 3855 and 3866 until you enter the American Independence Park. The well-paved drive up U.S. Vice President Hubert Humphrey Parkway will provide you with a stunning view of the Sorek valley, as well as the hills, valleys and the sea far into the distance. Along the way you can easily turn off into some scenic lookouts to enjoy the view below. Near the summit there are several noteworthy sculptures, which we will reflect upon at the conclusion of our visit to the cave. 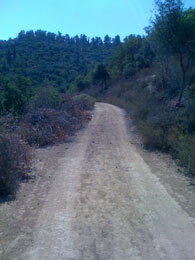 Now turn left to drive down the hill to the parking lot of the Sorek Cave Nature Reserve. From the parking lot it’s a up to 10 minutes by foot to the visitors center. Though the 150 stairs are well placed, the descent at times is steep, which you should be mindful of as you do need to climb back up to your car! By advance reservation, the physically challenged may be dropped off near the visitors center, but unfortunately, their access within the cave is limited to the observation platform . For further information please call the following number: 02 991 1117 or 02 992 5756. 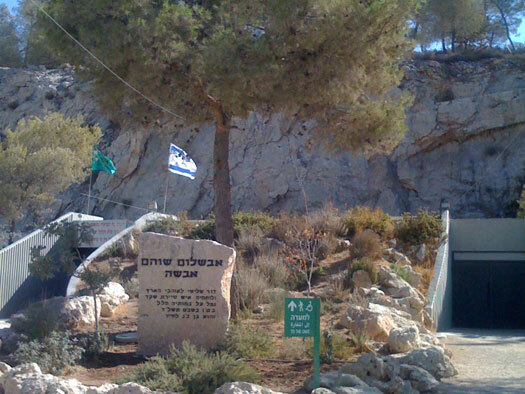 The Sorek cave and the surrounding nature reserve, is named after Avshalom Shoham, who as a member of an elite military unit, was critically wounded during the War of Attrition in 1971. When he succommed to his wounds several years later, his family wanted to ensure that his love for Israel would be memorialized, and assisted in making the opening of the cave to the public a reality. Interestingly, his family harkens back to the Bilu settlement movement of the early 20th century, and Avshalom is named for Avshalom Feinberg a member of NILI (see Zichron Yaakov blog). Start your Israel tour with a visit to the cave early in the morning or on Fridays when large groups are not permitted. Prior to your guided tour, it would be worthwhile to view the audiovisual presentation, which in detail explains the geological development and discovery of the Sorek cave. Most noteworthy is the fact that this small cave renders a full representation of almost all types of stalagmites and stalactites found in larger caves worldwide. After watching the film you can touch the stalagmites and stalactites that are on display. Especially for children, this can be one of the highlights of their Israel trip. The Sorek cave was discovered by chance in 1968 while workers were quarrying nearby. However, another decade would pass before it could be officially opened to the public. The cave is located on the side of Mt. Ya’ale, which is part of the Judean mountain range. Today, with thanks to the efforts of the KKL/JNF, the entire area is forested with Mediterranean woodlands and evergreens which are interspersed with walking trails, lookouts and picnic groves. The Sorek cave has been carved out of Mt. Ya’ale’s dolomite rock, through the seepage of rainwater mixed with carbon dioxide into fissures which expanded in time to create the cavern we admire today. The Sorek is a live cave, in that water continues to infiltrate through these fissures to slowly form the artful display of limestone formations known as stalagmites and stalactites, some of which are three hundred thousand years old. You’ll soon learn to identify this evidence of “life” by observing drops of water hanging at the tip of “macaroni” shaped stalactites. The tour, which is conducted in English and other languages, can last 40 minutes, depending on the number of visitors. The cave is well illuminated with lighting and shadows permitting you to visualize, with the assistance of your friendly Israel tour guide, formations such as a guardian angel, ice cream cones, Snow White and the Seven Dwarfs, a baboon, a marrying couple, a wedding cake, and Romeo and Juliet. The latter presents the question if these two growing stalagmites and stalactites will ever join and kiss. The walkway is constructed in such a manner that once inside you are at all times surrounded by this vast array of illuminated formation. At the conclusion of your tour you can stop at the visitors center and gift shop before returning to your car for the drive back up the mountain. As you reach the main road, turn left into the picnic grove and follow the dirt road to the summit of mount Ya’ale for an impressive view of the valley and plains that are spread out in front of you. There you will also find a number of diagrammed signs in Hebrew explaining significant battles that took place nearby during Israel’s War of Independence. As you descend the mountain, park in the picnic grove and carefully cross the road by foot to admire the memorial sculptures. The first metal elliptical sculpture depicting the earth is in memory of the Challenger astronauts that perished shortly after liftoff. It’s imposing size and shape near the summit of Mount Ya’ale is a moving tribute to these American explorers. Nearby is the plaque commemorating the Israeli astronaut, Ilan Ramon, who perished with the crew of the Columbia spacecraft. From the junction, it’s a 4 kilometer drive on Route 3866 to the Bar Giora visitors center (turn left at the sign Wadi Quetlef) where you can enjoy a full meal on the terrace or inside the rustic restaurant while taking in the view of the valley below. 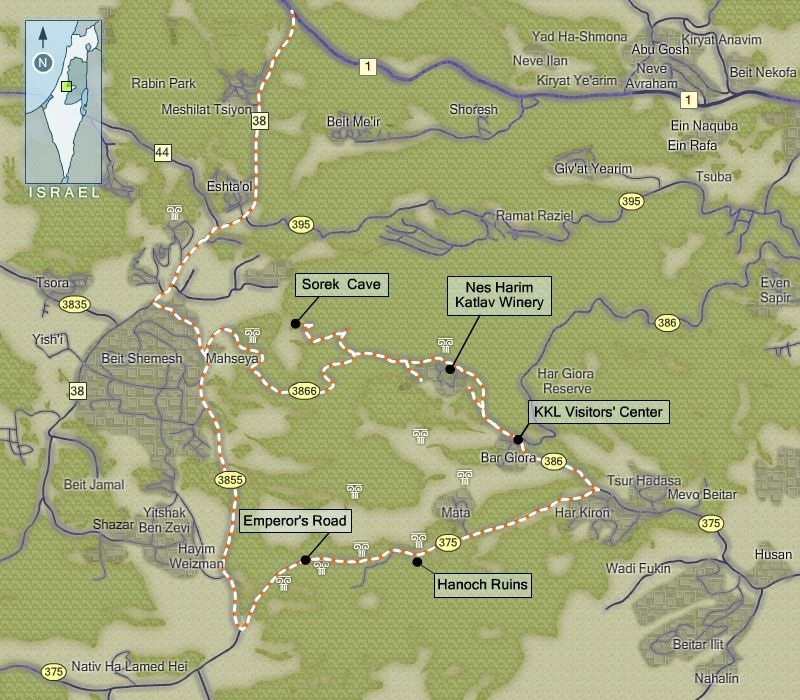 KKL/JNF maintains a kiosk at the visitors center with brochures in English and Hebrew describing hiking trails, archaeological sites and streams in the Jerusalem Mountains area. Opposite the restaurant are wall displays of geological formations, vegetation, and wildlife, which serve as excellent learning tools for Hebrew readers. 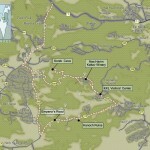 There is a also a large wall map in Hebrew identifying several hiking trails that start at the center. These are considered some of the best hiking attractions in Israel. Though I recommend the hikes at our next nearby stop, a short hike on the black-dotted trail will afford you views of ancient hillside terracing, the original Jerusalem-Jaffa train line in the valley below, a variety of indigenous trees and bushes and a sumptuous display of flowers in spring time. Alternatively, you may just wish to enjoy the view by strolling down the asphalt promenade, which is easily accessible to the physically challenged. 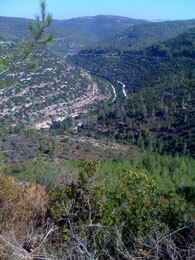 From there, it’s a 7 kilometer drive down Routes 386 in the direction of Zur Hadassah and 375 west to the Hanoth ruins. As you proceed down Route 375, you will note on the right immediately adjacent to the road in a picnic grove, the remains of an ancient inn or khan, dating to the late Middle Ages. This ruin, known in Arabic as Khirbet el-Khan, contains the nave of an earlier Byzantine church whose beautiful mosaic floor and inscriptions are clearly visible. If you don’t immediately spot them, use your foot to brush away the sand that has been placed there to protect the mosaics. The adjacent wine press also has a mosaic treading floor which is not as ornate. Nearby, a tree-covered mound with buried stones relates this site to Byzantine period pilgrims, who on their way to Jerusalem, would place a stone on the spot they believed was Goliath’s final resting place. This site may be of particular interest to those participating in holyland travel. You can now retrace your steps back to your car and follow Route 375 south to Route 38 toward Bet Shemesh and then north to Route 1 for your return to Tel-Aviv or Jerusalem.